It’s official, the first Australian Open and major tournament that I failed to watch a single live point. It really pains me to write such a sentence but such is the reality of life and all of the stresses and strains for the not-so-lucky. Anyway, a few highlight videos and virtual scoreboards have allowed me to keep vaguely abreast of proceedings. 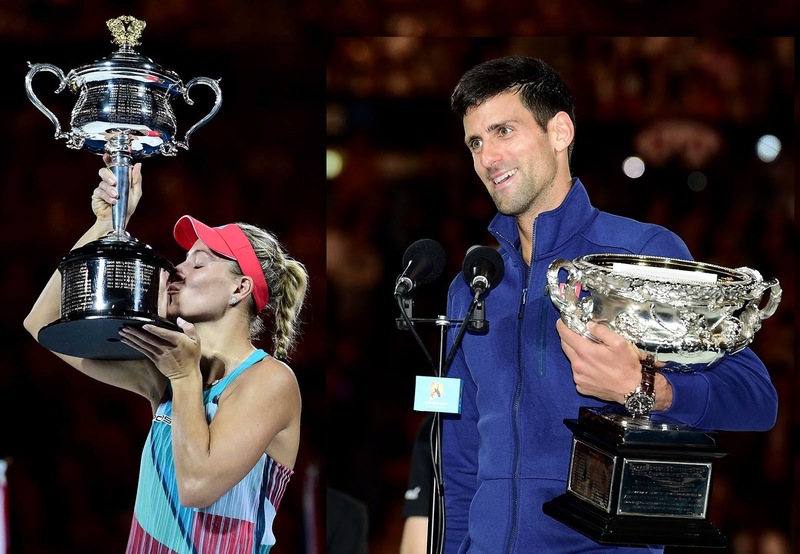 So, the finals – even though I predicted Radwanska to triumph and therefore didn’t see it a certainty that Serena would lift the trophy – I did not imagine that Angelique Kerber would become a Grand Slam champion. The German – who will rise to number 2 in the world rankings after this – has graced major semi-finals before of course, but really wouldn’t be on many people’s ‘first time slam winner’ radar before the likes of Radwanska, Halep or Bouchard. Yet the German’s game has looked bullet-proof all fortnight – at least after that shaky-ish first round where she saved MP’s. Instead, Kerber’s mental game proved to be the catalyst alongside a defensive masterclass that proved far too much for her opponents all tournament, and like others have done before, probably took Serena by surprise. I am a huge admirer of Williams Jnr, but she all-too often gets caught out by who she likely deems as lesser opponents (see Vinci, and Kerber now), she waits for the inevitable crumble and then panics when it doesn’t happen. What follows is the ugly post-match put downs involving a patronising. It was fairytale stuff and whilst Pennetta’s US Open victory was even more remarkable, Kerber’s maiden major is all the more exciting because her relative youth makes her the future of the game – at least more-so than the veteran Italian and her victim Saturday. For Serena – gracious in defeat – this was an unwelcome surprise to a year that may well represent her last realistic chance to truly dominate. Whilst the women’s tournament provided a heart-warming twist at its end, the men’s competition injected nothing more than a cold shower of reality. The draw unfolded in as cold and calculating manner as the tournament victor plays his matches, error free and as expected. Even Nadal’s early exit is less surprising the more one thinks of it; the Spaniard’s torrid 2015 will be hard to shake off. Once Novak Djokovic had all but blown away one of the true greats in the first hour of Friday’s semi-final, I had no doubt he would lift the trophy two days later. Such is the gulf in class between Federer and Murray right now that if Novak could beat the former then the latter had little chance. So it proved come the match earlier today, like Federer – Murray had enjoyed a truly superb tournament playing with class, authority and a confidence that really enhances his game and makes him a powerhouse on court. But neither the Scot or the Swiss have any hope of breaking down the Kevlar strength will and mental fortitude of Djokovic, the rest of the tour have similar odds barring a very special day, see Wawrinka in Paris last year. Nope, Novak is producing his career best form when it really matters now and has seemingly got his routine down to an absolute tea. The tournament ‘off day’ is now left for an earlier round – in this case the fourth against Simon – from then on in his business-like manner disguises an iron concentration and incredible fitness that renders his opponents – even the two best players of the past fifteen years – hapless, helpless and waiting for a miracle.